Pin Prick Picture from the collections of the Worthington Historical Society (WHS) may be used for educational purposes as long as it is not altered in any way and proper credit is given: "Courtesy of the Worthington Historical Society, Worthington, OH." Prior written permission of the WHS is required for any other use of Pin Prick Picture. Contact WHS at info@worthingtonhistory.org to request permission. Pin Prick Picture is an art original. Its dimensions are 6.81 in. x 5.75 in.. It was created in 1836. Worthington Historical Society is the Contributor. Grace Gilbert is the Creator. Pin prick picture of Mary Griswold (b. November 13 1833 d. May 6, 1866) daughter of George Harlow Griswold and Mila (Thompson) Griswold. 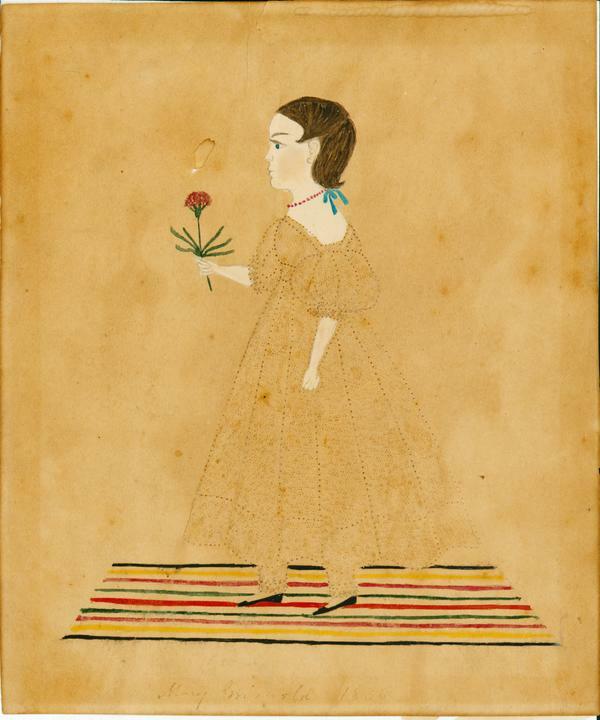 Pencil and oil, outline of child with early 1800 Empire dress. Pinprick pictures and greeting cards were a popular craft during the nineteenth century. Greeting card, valentines, and other tokens were made by hand by both men and women. It covers the topic art. It features the person Mary Griswold, 1833-1866. The Worthington Historical Society identification code is 79-G-266. The Worthington Memory identification code is whs0170. This metadata record was human prepared by Worthington Libraries on November 12, 2001. It was last updated November 17, 2017. With fall’s vivid colors painting the landscape, there’s no better time to celebrate the visual arts. Our November exhibit features paintings and sculptures made by and about Worthington's residents.